I well remember my youthful zeal, when things were clearly black and white. I remember thinking and vowing that I would stay firm to the end, and that my love for Jesus would stay white hot. But with the passing years, and the circumstances that leave scars and the unrelenting pressure to go with the flow, I better understand and appreciate what Jon Bloom writes of when he speaks of the temptation to compromise. Life doesn’t just happen. Life is the countless choices we make every day – choices that will either keep us in step with God’s Spirit or choices that little by little will smother our spiritual passion. As you read the article below, invite the Spirit of God to impress upon your mind and heart if there is anything that you need to turn from in order that Jesus might again have the place of prominence in your life. As we give thanks to God for his “abounding faithfulness,” it is good for us to examine our own faithfulness. How faithful are we? This is important because “it is required of stewards that they be found faithful” (1 Corinthians 4:2). And a gauge of our faithfulness is our level of lukewarm-ness. Lukewarm-ness is the dying of conviction. And conviction often dies the slow death of a thousand compromises. When I was 22 years old, I worked at a company where my supervisor was defrauding customers and asking me to comply by fudging inventory reports. I refused and raised serious concerns about his conduct. This got back to the company owner, who one day asked me into his office and sagely said, “When I was your age I also saw things in black and white. But I’ve come to learn that things are mainly shades of grey.” Fraud isn’t grey. If the customer became aware of the fraud, the colors would have sharpened very quickly. But what had happened to this owner that made his youthful black dilute to grey with age? Well, now that I’m near the age he was back then, I understand more. I know how life experiences can season and temper the soul. But I also know that his sort of “greying with age” is not the tempering of age-acquired wisdom. It is the result of failing to be faithful, of being lured and enticed and ensnared by our sinful desires. Truth does not grey with age. Rather, our moral eyes cloud from the cataracts of compromise. And with each compromise we lose more resolve to see truth and be faithful to it. We call black grey only to ease our consciences. Most of us in the prosperous West live in modern day Laodicea (Revelation 3:14–22). Our faith is not endangered by persecution but by the constant temptations of worldly compromise. Jesus, the “faithful and true witness” (verse 14) rebuked the Laodiceans for having grown “lukewarm” (verse 16) in unfaithfulness and exhorted them to “buy from [him]. . . salve to anoint [their] eyes” (verse 18) to heal their cataracts of compromise. 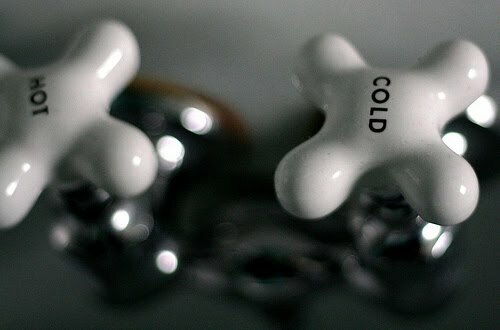 If a fever is a symptom of disease in the body, lukewarm-ness is a symptom of the disease of unfaithfulness in the soul. And like all of us experience bodily fevers and fight disease, all of us experience lukewarm-ness to greater or lesser degrees and must fight the disease of unfaithfulness. If we feel lukewarm, how do we fight the disease? Our faithful and true Physician gives us his prescription: “be zealous and repent” (Revelation 3:19). But how does a lukewarm person just “be zealous”? Isn’t that the problem — not being zealous? No! The problem is not perceiving the disease of which lukewarm-ness is a symptom. If you think all that you have is a cold, you may not think much of a fever. But if you find out that cancer is causing your fever, suddenly zeal is not a problem. Lukewarm-ness is a symptom of the cancer of unfaithful unbelief in the soul. If left untreated it will result in an unspeakably horrible experience: Jesus will spew you out of his mouth (Revelation 3:16). It is not the unfaithful who receive the eternal reward. The reward goes to “the one who conquers” (Revelation 3:21) — the one who fights and overcomes. Jesus’ hard words of warning to the Laodiceans was grace. He wasn’t telling them to earn their salvation by being faithful. He was telling them that lukewarm unfaithfulness might be evidence that they didn’t have saving faith. It was a “you have cancer” moment. And he had the treatment. He was telling them to repent and come back to him for healing. That’s the grace he extends to most of us followers who, like Peter (Luke 22:60–62), fall at some time into the sin of unfaithfulness. Repentance is the evidence of real, if deficient, faith. To remain faithful is not merely a struggle. It is war. To be faithful to God, our spouse, our children, our church, and our vocation, requires that we fight every day against the indwelling sin that presses us toward compromises. Don’t coddle little compromises. Kill them. Fight the good fight of faith (1 Timothy 6:12) by fighting fiercely for fidelity. Repentance becomes a holy habit of the faithful fighter. The sin of compromise is always crouching at our door and we must rule over it (Genesis 4:7). We do this by cultivating the skill of taking every thought captive to obey Christ (2 Corinthians 10:5). In your thanksgiving, thank God for the grace of his hard words that, in kindness, leads you to repentance (Romans 2:4). Resist the devil (James 4:7), repent of any greying of black, and fight lukewarm-ness like the plague.